The XUV300’s head-turning, cheetah-inspired design, ‘fun-to-drive’ performance, best-in- segment safety features, first-in-segment hi-tech features and class-defining interiors, make it an exciting & comprehensive package. Mahindra & Mahindra Ltd. (M&M), a part of the US$20.7bn Mahindra Group, launched its highly-anticipated new SUV, the XUV300 (pronounced as XUV 3 double ‘Oh’) at an ex-showroom starting price of Rs7.90 lac for the Petrol W4 variant and Rs8.49 lac for the Diesel W4 variant (one price applicable across India). 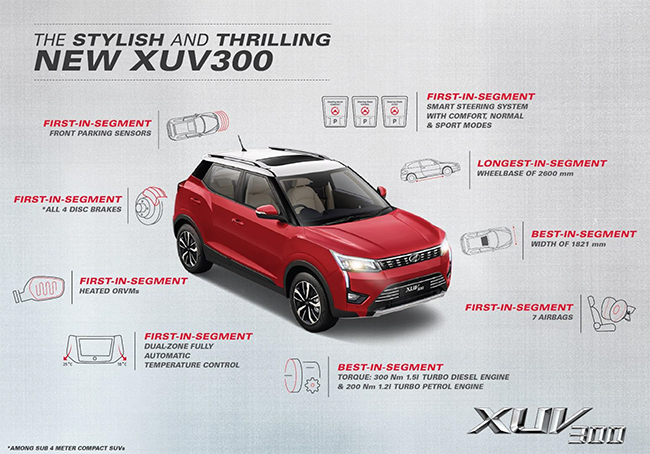 The XUV300’s head-turning, cheetah-inspired design, ‘fun-to-drive’ performance, best-in- segment safety features, first-in-segment hi-tech features and class-defining interiors, make it an exciting & comprehensive package. It will be available in both petrol and diesel engine options. The XUV300 offers Best-in-Segment safety features. First-in-segment* disc brakes on all 4 wheels (*Among Sub 4 meter Compact SUVs). Electronic stability program with Dynamic Steering Torque, Hydraulic Brake Assist, Roll- over Mitigation and Traction Control. Together with Hill Start Assist. The XUV300 is home to an array of hi-tech features that take the driving experience to a whole new level. The XUV300 allows you to adjust the air temperature to create separate, customised environments for the driver and front passenger. With 3 memory slots for your preferred setting, you won’t waste time prepping up for your joyride. With its aggressive front grille, chiselled body and imposing stance, the XUV300 always looks ready to charge. Its projector headlamps and striking LED Daytime Running Lamps leave a lasting impression. While its unique LED tail lamps create an indelible visual signature. Add to this the sporty, 43.18 cm Diamond Cut Alloys, and you have an SUV that meets every demand of the urban jungle, in style. Ample space welcomes you inside the XUV300. Its spacious cabin, with Best-in-Segment width of 1,821mm, Longest-in-Segment wheelbase of 2,600mm and a flat floor can comfortably seat 3 passengers in the 2nd row. While the finely crafted, dual-tone dashboard and a sophisticated, electric sunroof with anti-pinch function, elevate the standard of luxury to new heights. Premium leatherette seats with well-designed bolsters, a leather-wrapped steering wheel and a racing ready gear knob await you.